WASHINGTON – (CT&P) – At a hastily called press conference this evening, CEO and Executive Vice President of the NRA Wayne LaPierre blamed today’s mass shooting in Oregon on dangerous ‘gun free zones’ around schools, churches, and government buildings. The shooting, in which at least 13 were killed and at least 20 more wounded, occurred at Umpqua Community College, which has about 3,000 students, in a rural community about three hours south of Portland. The first calls came in at 10:38 a.m., local officials said, and the college was put on lockdown as a number of law enforcement agencies responded. The gunman died after an exchange of gunfire with the police. The NRA was quick to respond to the tragedy, releasing a statement even as the last bullets were being fired by the perpetrator and law enforcement. The statement emphasized that if only we could do away with liberal politicians and communist school administrators that push for gun free zones around schools and other public buildings these types of senseless tragedies could be avoided. 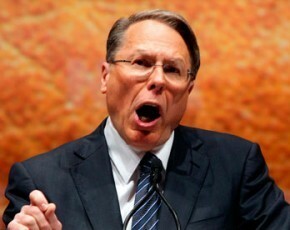 At LaPierre’s presser later in the day LaPierre stressed that the only way to stop mass shootings in America was for every citizen to be armed from childhood to death with automatic weapons and large capacity magazines. “We have to stop this senseless violence,” said an emotional LaPierre. “The NRA has always been against these dangerous gun free zones. Whenever any group of people is walking around unarmed it’s just asking for trouble. In the next session of Congress, we intend to push for a bill providing free or discounted weapons to all Americans. And it’s not just guns we need. We’ve partnered with our friends in the manufacturing sector to push for the legal ownership of RPG’s, flamethrowers, and crew-served automatic weapons. Tell the NRA to go o a diet. Tell them bullets are gluten-free.